Pulp and Paper Industry: Chemicals features in-depth and thorough coverage of Chemical additives in the Pulp and Paper Industry. It discusses use of Enzymes "Green Chemicals" that can improve operations in pulp and paper, describes Chemicals demanded by the end user and many key and niche players such as Akzo Nobel NV, Eka Chemicals AB, Ashland, Inc., BASF, Buckman Laboratories International, Inc., Clariant, Cytec Industries, Inc., Enzymatic Deinking Technologies, LLC, ERCO Worldwide, FMC Corporation, Georgia-Pacific Corporation, Georgia-Pacific Chemicals LLC, Imerys SA, Momentive Specialty Chemicals, Inc., Novozymes, Kemira Chemicals, Nalco Holding Company, Omya AG, Solvay AG, and Solvay Chemicals, Inc.. Paper and pulp processing and additive chemicals are an integral part of the total papermaking process from pulp slurry, through sheet formation, to effluent disposal. Environmental concerns, increased use of recycled waste paper as a replacement for virgin pulp, changes in bleaching and pulping processes, increased efficiency requirements for the papermaking process, limits on effluent discharge as well as international competitiveness have greatly impacted the paper and pulp chemical additive market. 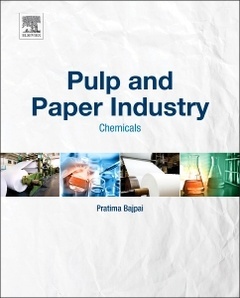 This book features in-depth and thorough coverage of Chemical additives in Pulp and Paper Industry. Authoritative, thorough, and comprehensive content on a wide variety of Enzymes "Green Chemicals"